Thank goodness the boss *usually* falls asleep on the job a couple times a day. E. is napping in our bed. My fingers move quickly because I never know how long I have until she awakens. Some days I get hours, others minutes. The result is an inability to focus. Do I work on my novel? Do I blog? Do I catch up on sleep? Undoubtedly, her eyes will open when I have settled into a rhythm on my own. I have learned to save everything we can do together, like eating and cleaning, for when she is awake. Generally, I cannot bring myself to nap. Time alone is worth the occasional deprivation. This is possibly the hardest lesson of early parenthood. Everything cannot be done. Must prioritize. As much as I love yoga, it has become a once-a-week activity. Today my husband watched E. while I went to class. Tears streamed down my face as I lay in Savasana, thoughts of growing old and E. caring for me instead of the other way around. Life, cyclical and gone in a blink. Back home, I cuddled her to sleep in our bed, lingering an extra twenty minutes, minutes I could have had to myself but were too sweet to give up. Choosing to sleep in the same space has been on my mind a lot lately. As with anything, not everyone gets it. Sometimes I question our choice, too, on hard nights, when she cannot sleep and I am stuck beside her for hours to keep her calm. Then I remember like everything before, this will pass. The alternative would require “sleep training,” and I am just not willing to let her scream for long. Some babies go down with less of a fight and E. is called Little Beast for good reason. Most importantly, when it works, co-sleeping is a beautiful part of our life. Moments together, close, savoring now. We don’t worry she will be in our bed forever. We know the time will come when either we will encourage her into her own space, or she will say “Peace, y’all.” Seeing as how she demands to feed herself already, I have a feeling she will be asking for a “big girl bed” sooner than we expect. A recent parenting piece in the Washington Post struck a chord. Sometimes the path of less stress is better for everyone. Maybe we could teach E. to sleep on her own with a few nights of intense “training,” but for what? So I would have to get up to comfort her instead of just rolling over? So we could sleep without her in our bed? The truth, co-sleeping is just as much for us as it is for her. We crave the connection, too, her sweet little body curled between us. When it consistently stops working we will find a solution. Until then, I am happy to watch her nap all snuggled in our bed while I sit in my big, brown chair and steal some minutes for myself to write. Nothing lasts forever. Part of me wishes it would. I cannot help but think back to all the nights I lay awake in bed, pregnant, talking to her in my belly as she twirled about. I already loved her intensely then. The night we stop sleeping next to E. will be a bittersweet one. We were definitely co-sleepers with our kids when they were babies. And we definitely raised our eyebrows at the neighbors who had their kids sleeping with them until they were four or five. But you provide a great explanation for the benefits and reasons for it. As with so many things involved in parenting, you should do what works best for you and ignore the naysayers. As you describe it, her sleeping on her own will find its way into your lives at its own pace. Enjoy what you have now while you have it. OOPS … that should have said “We were definitely not co-sleepers…” Ergh! It’s one of those things that seemed so black and white to us back then and now I wonder if co-sleeping would have been better. 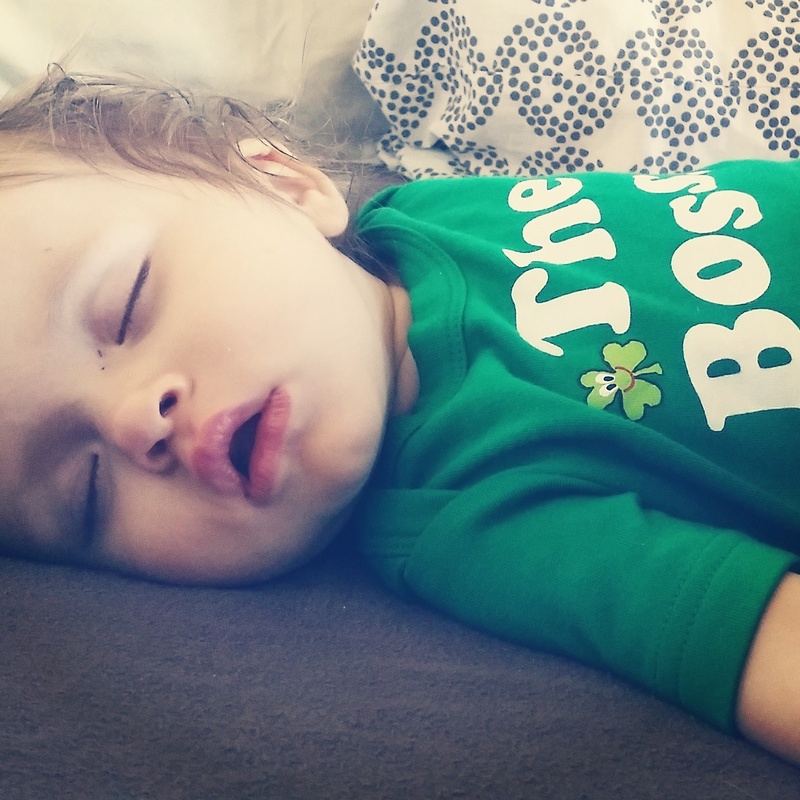 I think there is definitely a generational shift toward co-sleeping underway– half of our friends sleep with their babies, but it still seems to be one of those hush-hush things. I was scolded for sleeping next to her in my hospital bed, but it was the only way she would stop crying and I was exhausted. As they get older it seems to create a different challenge when it is time to move them elsewhere, but for now we’re okay with that. Whether it creates a stronger familial bond is yet to be determined in our case, but many people claim it does. It is an interesting question as to whether or not it makes a difference, I just know it buys us more sleep with a fussy sleeper! That last line … That’s really the only thing that matters at some point. Our first child was a fussy sleeper for more than two and a half years. I wonder if co-sleeping would have been better for all involved. You guys were troopers, 2.5 years had to be rough! Yep. Every night was a mystery. Would he sleep relatively peacefully through the night or would we be up three or four time? No two nights were the same. I sometimes wonder how we survived. The second was the complete opposite. Once he started sleeping through the night he always did. So sweet to imagine Ollie little and asleep with you– and, I often think of that quote, so glad you shared it, such an important reminder! Truly, I don’t know how people can nurse and NOT cosleep. It saved me from complete sleep deprivation. If I had to get up and go into another room I would have been wrecked every night. But you’re right, it’s really more than that. It’s about what we as parents get from it too. I remember snuggling into bed with my husband and daughter between us one night and just thinking how special that I got to spend those sleeping hours with both of the people I love the most. It was beautiful and fleeting and the switch into her own bed (gradually with some gentle nudging on our part) felt natural and more or less easy when it happened. Sometimes parenting is about filling up our own cups so we don’t regret missing out on something precious in the future. I know I will never regret those nights spend snuggled in with my baby. So beautifully put! Also encouraging to hear the transition went well for you to her own bed!